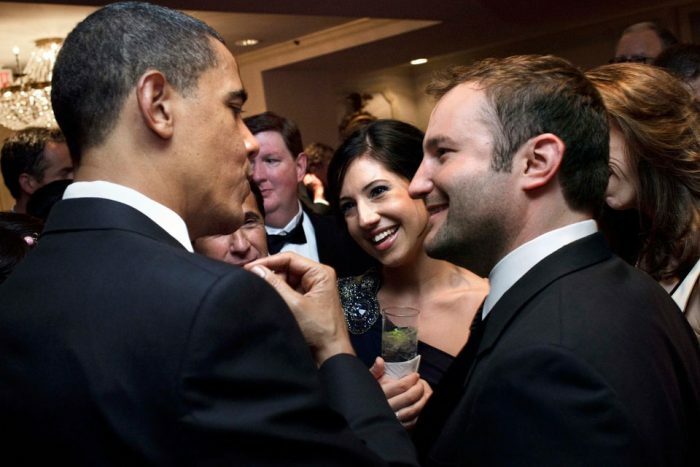 President Obama speaking to David Greene and other attendees of the 2009 White House Correspondents' Dinner. President Obama, Jennifer Loven, and Brian Williams of NBC News presented this year’s journalism awards at the 2009 White House Correspondents’ Dinner. 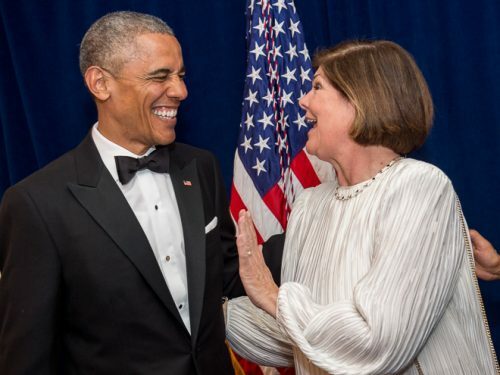 Sandra Sobieraj Westfall won for taking her readers inside the room for an “intimate and detail-filled portrait” as Barack Obama heard the results of his history-making presidential bid, according to the judges. The Merriman Smith Memorial Award winner for broadcast journalist, National Public Radio’s David Greene, receives congratulations from President Obama. 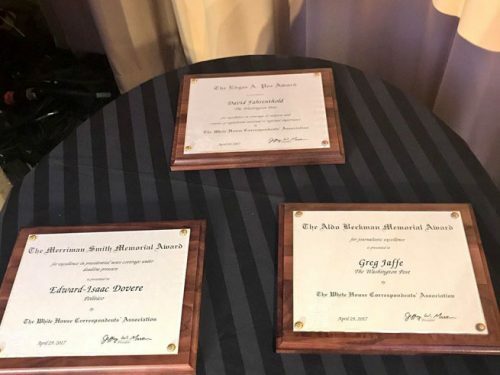 David Greene, the winner in the broadcast category of the Merriman Smith Award, won for his coverage of candidate Obama’s speech that addressed the nation’s racial divide. The Merriman Smith Award carries a cash prize of $2,500 for each winner. The judges declared that Greene “masterfully” set up the problems mounting for Obama’s campaign when stories surfaced about controversial remarks by his longtime pastor, Rev. Jeremiah Wright, just as the candidate was struggling to appeal to appeal to all voters. 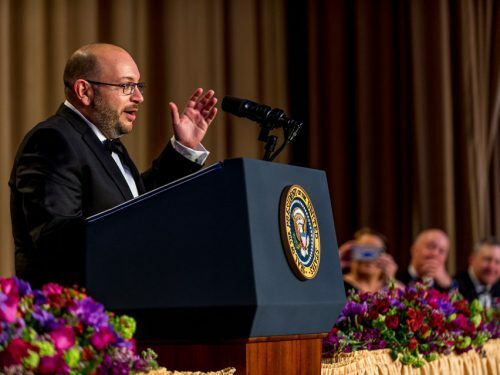 Michael Abramowitz won the Aldo Beckman Award for his coverage of the final days of the Bush administration. At the time, Abramowitz was covering the White House for The Washington Post, where he had worked since 1985. (In February 2009, Abramowitz was appointed Director of the Committee on Conscience, which guides the genocide prevention efforts of the U.S. Holocaust Memorial Museum). Michael Berens and Ken Armstrong won the Edgar A. Poe Memorial Award for a three-part series in The Seattle Times that exposed the failure of hospitals in Washington state and across the country to control the deadly rise of the MRSA staph infection. Combining in-depth reporting and data analysis with the stories of victims and activists, the series explained the science and uncovered the public policies and corporate interests responsible for this epidemic. Online the series provided a searchable database, explained the reporters’ methodology and invited reader comment. The award is named in honor of a now-deceased correspondent of The New Orleans Times-Picayune. Edgar A. Poe also was a former president of the correspondents’ association. The judges of the Poe award also gave honorable mention to Gary Fields and Jonathan Kaufman of the Wall Street Journal for their insightful stories on race and violence in America, and African-Americans attitudes’ toward the 2008 presidential campaign. Honorable mention was also offered to reporters from two different publications for similar work on the threat to U.S. security and infrastructure from Chinese computer hackers who penetrated military Websites and possibly the American electrical grid: Shane Harris of National Journal as well as Brian Grow, Keith Epstein, Chi-Chu Tschang, Cliff Edwards, Brian Bursed, and Ben Elgin of Business Week.